Recently I noticed that I had a new blog follower, The Editor, aka Marie Ennis O’Connor, who writes Journeying Beyond Breast Cancer. As I am a big fan of health-related blogs and the show The Big C, I checked out her blog and found an amazing treasure-house of wisdom, compassion and support for cancer survivors, friend and families. Her My Story page made me think of the wellness aspect of cancer and of all serious illnesses. Ms. O’Connor talks about how support is needed long after the cancer is gone. People often do not realize that long after we lose a loved one, the funeral is over or people have beat an illness or recovered from an injury or trauma, there can be lasting psychological effects. I recall a friend telling me years ago that she needed more support many months later after her father died, not just during the funeral. People did not want to talk to her about her father’s death, however. It made them uncomfortable and many did not understand her pain and grief many months afterwards. Luckily she had a few close friends that had lost parents to and she could share and find support with them. Social support is an important part of stress management. Having people we can turn to when we are having a hard time is important to our well-being. The blogosphere is one way that survivors can share and find social support among people who have similar experiences. If you have had breast cancer or know someone who has, read her blog. it can inspire you and may comfort you. And maybe even give you a new social support network. • A great post about the social hierarchy of suffering,Is there a hierarchy among cancer survivors? • Go to this link for a collection of great blog posts about the Psychology of Cancer. • Go to this link for a a great guest post about one woman’s story and the importance of early detection and being assertive with medical personnel. 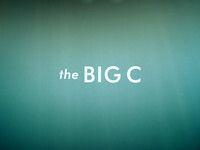 And check out Showtime’s The Big C if you want to watch a somewhat humorous take on a woman going through her own fictionalized story of cancer. Note: I do not get any advertizing dollars or any other compensation from Showtime for plugging the show, The Big C. If I did I could likely retire. I just like the show and I think watching it gives people insight into some of the issues cancer survivors struggle with.